Hello and welcome to The Percy Inn, a stylish and intimate 1830 urban inn, situated in the heart of Portland's West End Historic District at Longfellow Square. We're delighted you've come for a look, and hope you find everything here you need to make a trip to Portland an exciting and fulfilling one. You're in for a treat because we share the West End with a clutch of distinctive inns and bring to the collection our own flavor and hospitality. I hope you’ll be our guest this time around so we can offer you the skinny on everything Portland up close. Or if your travel plans bring you to other worldly locales along the way, perhaps you’ll let me guide you to the world’s best hotels and cruise ships by catching my travel commentary on syndicated travel radio and podcasts. I'm travel writer Dale Northrup, and I've been telling people where to go for over 25 years. As author or co-author of nearly two dozen consumer travel guides from New England to Asia, I've seen many of the nooks and crannies we Maine natives often keep to ourselves. My background writing 23,000 hotel reviews for travel agent hotel guides in 70 countries makes me appreciate the wonderful surroundings my hometown affords. We’re delighted NBC chose to showcase the Percy Inn in a travel getaway segment on the TODAY SHOW, the only lodging choice in all New England. And we’re still glowing in response to being named Best Bed & Breakfast in New England by YANKEE, the magazine of New England and also to be included in Martha Stewart’s Blueprint magazine about the best of Portland. What a treat to be welcoming new guests to our door after such kudos. Anyone who has traveled New England extensively has a favorite place to stay and we’re sure many of our guests share our enthusiasm for the host of lovely inns to choose from around the region. Surely you will appreciate the breadth and depth of our recommendations – now accommodations ranging from traditional amenity-rich guest rooms at our main inn in Portland to accommodations on the Southern Maine coast, and in South Florida. Capture a few days in the innkeeper’s cottage overlooking the salt marsh and ocean in Wells, Maine or the chic condominium overlooking Biscayne Bay in South Florida. We can also steer you to a trio of historic apartment suites situated in our own neighborhood available for long-term rentals. Glance at new photos and our press clips page – apologies for sharing the kind words the media says about us – but perhaps you’ll find them helpful. You’ve read about us in Vogue, Travel & Leisure, the NY Times, Arthur Frommer’s Budget Travel Magazine, the Boston Globe, National Geographic Traveler, Fodor’s, BestFares, Passport, Chicago Tribune, Yankee, and more. Not only will you discover fine lodging in Portland, but our city boasts an enviable selection of restaurants that run the gamut from cozy wine bar cafe to regional cooking venues to rival your favorites back home. You won't be disappointed if you want seafood on the water, at the shore, or atop the rocks with waves crashing before you. On behalf of all of us in Portland and The West End, we welcome you to a town, and a neighborhood, you won't shortly forget. 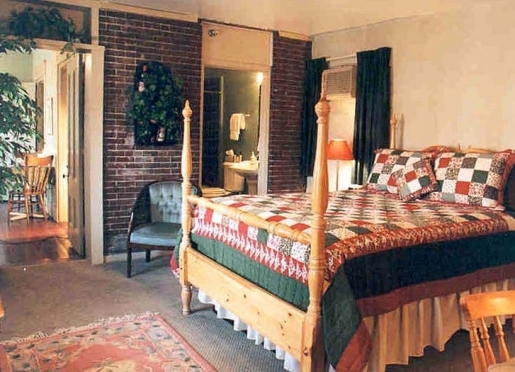 The Percy Inn is housed in an 1830 Federal-style brick rowhouse built in 1830, ten years after Maine became a state. 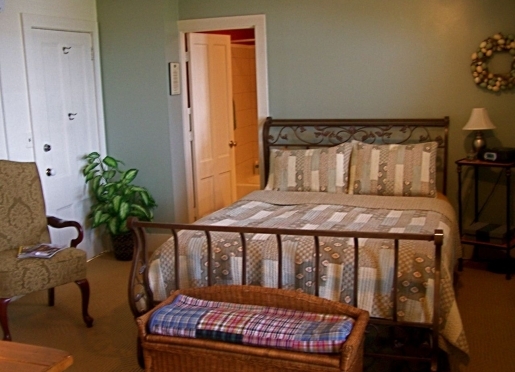 A thorough renovation was undertaken to transform the building into an inn in 1997. 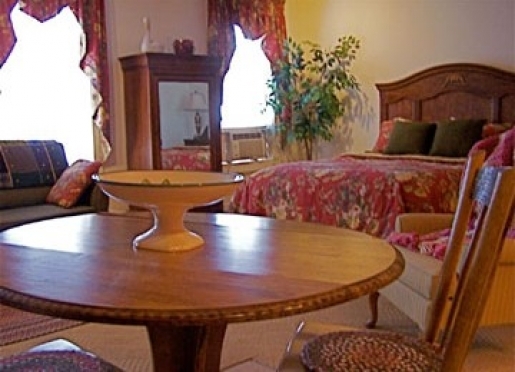 All our guest rooms feature the same amenities: TVs with VCRs or DVD players, phone and fax machines, WiFi, CD players, weather radios, climate control, queen beds, seasonal air conditioning, wet bars and refrigerators stocked with complimentary soft drinks, and private baths. Rates include breakfast and parking. Breakfast is served in our second floor breakfast room between 8 and 10 a.m. Our Continental buffet consists of boiled eggs, a selection of hot and cold cereals, fresh cut fruit of the day, breads and muffins, yogurt, juices, and a choice of teas and coffee. The breakfast room is open all day for snacking and our pantry refrigerator is stocked with complimentary soft drinks, and juices for mixers. We offer seasonal drinks such as hot mulled cider or chilled lemonade afternoons and evenings. The Poet's Corner on the third floor features a choice of coffee, hot chocolate, and regular, herbal, and decaf teas 24 hours a day in an intimate nook with a collection of books on Maine and New England travel, and board games. Ice is also provided here. 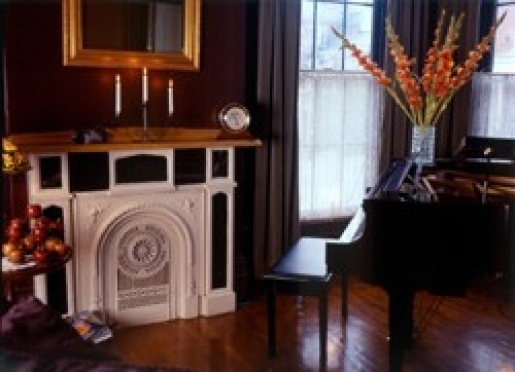 Besides the breakfast room and Poet's Corner, the inn offers a fire placed living room with a collection of books and compact discs for your enjoyment. Compact disc players are also found in guest rooms. A library of 400 movie titles is kept in the armoire as well or enjoy our player grand piano. Our landscaped side and back yard provide spots for reading and enjoying Maine's all-too-brief good weather. In summer we have a side garden to enjoy and a sunny 560 square foot deck where you can sample the sun or shade with a cold libation. For adventuresome guests, we have a garage for storing bicycles, kayaks, canoes, or other sports equipment during your stay. The inn is located one hour from decent downhill skiing.